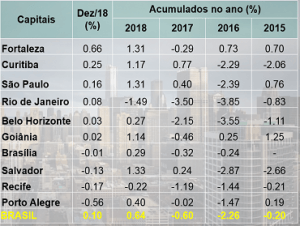 2018 was a year of stability for Brazilian property as a whole with most markets registering very slight price fluctuations. Some cities, however, saw much higher variations and among them the capital of Ceará in Northeast Brazil. According to two indices, Fortaleza property posted the best results in the country in 2018. According to figures released by the Brazilian Mortgage Association (ABECIP in Portuguese) for December last year, property prices in Brazil went up by just 0.1% in the month. The total increase for the year was also modest at 0.64%. However, the IGMI-R ABECIP Index indicates that in 2018 the Brazilian property market posted the first positive data since 2015. At the top of the table of the 10 cities covered by the ABECIP Index stands Fortaleza. The capital of Ceará state registered a price increase of 1.31% in 2018, the best on the table. Property in Sao Paulo also went up by the same amount, although prices in Brazil’s economic capital dropped in December. Salvador property went up more than Fortaleza (1.33% in the year), but the price fall at the end of the year places the city further down the table. The report points out that although several cities showed positive growth at the end of 2018, just two compared favourably with previous years. Fortaleza and Goiânia were the only capitals to show real growth last year when compared with falls in previous years. As the graphic below clearly shows, Fortaleza property had the best results in both 2015 and 2016. While the ABECIP Index shows an increase of 1.31% in Fortaleza in 2018, the INDEX FORTALEZA points to an even higher figure. According to this index compiled by Imovelweb, one of the largest property portals in Brazil, prices for Fortaleza property rose by an average of 2.3% last year. Prices for housing in districts SER III and SER IV went up by 3.8% and 4% respectively. At the end of December, the average rise for a square metre in Fortaleza stood at R$5,175. The most expensive neighbourhoods were Meireles with a square metre price of R$7,441 and Mucuripe with R$6,976. At the other end of the scale, the square metre price for property in the cheapest areas of Fortaleza cost R$2,437 in Bela Vista and R$2,660 in Prefeito José Valter. According to Imovelweb, there are currently 7,000 apartments on the market in Fortaleza. The majority of properties have three bedrooms and at least one parking space. The Index reveals that a 2-bedroom apartment with 65 square metres of living space and a parking space costs an average of R$336,400. “You can see market stability in Fortaleza,” said Leonardo Paz, CEO of Imovelweb. “We expect house prices to remain stable in 2019 and for the market to continue its growth.” Much depends on the national economy, but analysts believe three factors point to strength in the Brazilian property market: improved mortgage terms, historically low interest rates and a positive economic outlook.